As century trees and agave plants lead the way into our 24-acre estate property on Howell Mountain. In 2018, the Somnium vineyard was certified organic, further solidifying our commitment to quality and purity in every bottle of wine we craft. 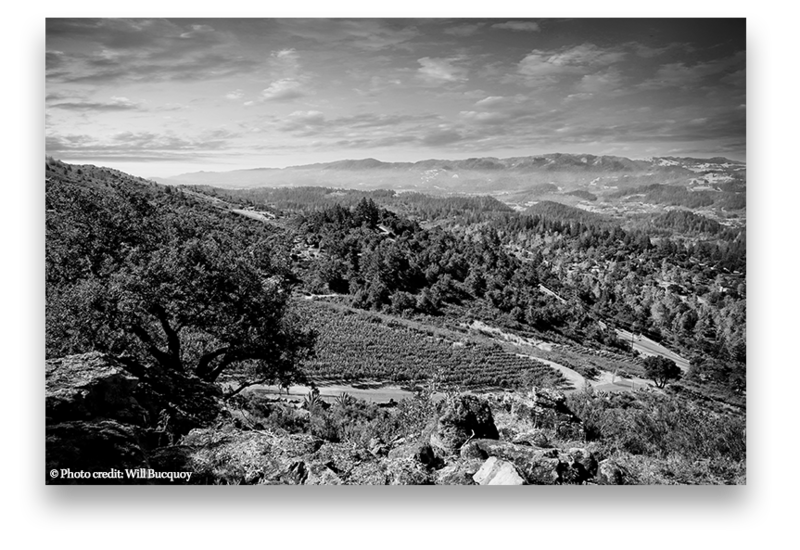 The vineyard property climbs as high as 1000 to 1375 feet and is defined by the volcanic rock hillside that contributes to the robust and structured nature of Somnium wines. Our position on Howell Mountain benefits from direct exposure to the sun, which is tempered and filtered at precise levels through active canopy management. The light breezes off the mountain flow freely through six plantable acres comprised of Cabernet Sauvignon, Cabernet Franc, and Petit Verdot, which have been hand-farmed and organically grown since the beginning. Our Cabernet Sauvignon stems from Weimer Clone and Clone 30, each offering unique characteristics to our wines. Weimer is rumored to be a “Samsonite” clone, which tends to ripen early thus lending an exceptionally dark color and nuance to our Cabernet. Clone 30 was spawned from the Disney-Silverado selection of a storied vineyard near the Silverado Trail in the Stag’s Leap District. The property was once owned by Harry See of the famed See’s Candie empire and eventually sold to Lillian Disney. Vintner and winemaker Aaron Pott is intimately involved with our vineyards to ensure fruitful and healthy growth throughout all aspects of the growing season, from pruning straight through to harvest, ensuring that each event happens at the optimal moment. Aaron, together with Pina Vineyard Management, have been tending to the vines since 2009 when Danica purchased the property.